1946. Seattle, Washington. 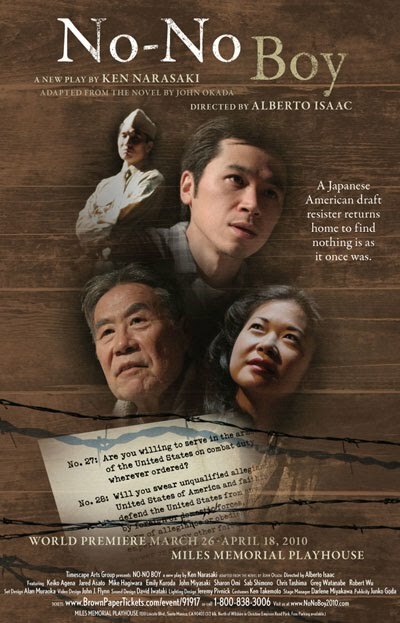 A Japanese American draft resister is released from prison and returns home to find nothing is as it once was. He struggles to piece together his war torn world. The same artistic team produced Innocent When You Dream (Critic’s Choice LA Times, Pick of the Week LA Weekly), which had a successful run at Electric Lodge in Venice and was later invited to perform at the Smithsonian Institute (Washington, DC) in 2008. for more information please visit: www.timescapearts.com. Funding for this production of No-No Boy was provided by the California Civil Liberties Public Education Program, a program of the California State Library. Timescape Arts Group is a (non-profit 501 (c) (3)).